THE MoTIS MGAF GA1 AERO FLEX as she is called is one of the first of our Difcraft aircraft fresh out of the design shop! This aircraft is a favorite of the MoTIS designers and we are very proud of this little wonder! This aircraft also coined the BEE TAIL , because of its obliquely shaped nose, like a bees tail, is a true Difcraft as this design takes into consideration three fundamental preexisting aircraft designs concepts. The Gyro plane, the Hang glider, and the Lift body data from real world NASA lifting body research . (From the days of lifting body test flights-( Data site here- NASA LIFTING BODIES). This aircraft use what MoTIS CAD designs are calling the VARIABLE PITCH VERTICAL MOUNTED HANG LIFTING BODY WING!- VPMHLW (All designed and developed by team MoTIS AS VIRTUAL TECHNOLOGY! )- All rights reserved. This aircraft is the sole design work of virtual neo concept design pioneer O. WATSON and J .Guess as its primary designers and numerous student contributions went into making this Difcraft FSReality potential high enough to express it in our favorite FS programs as a potential new aviation concept (THE VPMHLW that is)... The development of the flight model was trying to say the least and she is still some what unstable! Its like mounting a composite semi ridged hang gliding wing onto a fat nosed (designed that way for center of gravity range reasons) composite trike that is the size of a piper warrior! (Surface area especially!) 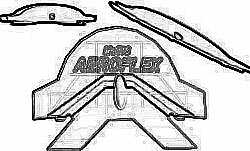 The AERO FLEX is so very light in construction due to the modern composite techniques! This aircrafts skin is so light and strong that we are giving it a virtual test thickness of only 1.2 inches in diameter. The panel is of a new ergonomically constructed design that has an integrated 2 way MDF in the central console as well as two PFD units that are laved out in numerically expressed digital flight performance values. This is considered a high quality MoTIS neo concept panel design. SWING LIFTING- Torque swinging the lifting body wing against the alternating CG position and moments against the moving lift vectoring wing and the thrust vectoring engine moments! (If you are not a big aerodynamics design buff-THAT TRANSLATES INTO A LOT OF LIFT, a super low stall speed, a awesomely slow flying plane at minor and major critical AOA's and (If we can keep it stable and in good CG range limits and super full reduction in forward cruising speeds-which are low any how as she is just a small craft by weight in the prototype testing phase), and as all aircraft function in the transportation business in some capacity-larger carrying loads if we develop her further into a passenger/cargo aircraft of some type. Hint... .. The aircraft can be configured to carry larger surface area LEVARC LIFTING BODY WINGS ALSO!